This year marks the 50th anniversary of the founding of Southern Baptist Disaster Relief. Tennessee Baptist Disaster Relief began when Tennessee Baptists responded to an explosion of a train tanker car in Waverly, TN in 1978. Since then, the responses have been within Tennessee, throughout the United States, and even around the world. Some have been small, with only one or two people going to provide leadership. Others have required literally thousands of volunteers and continued for many years. Most responses extended far beyond the initial response, especially the “Rebuild” responses. 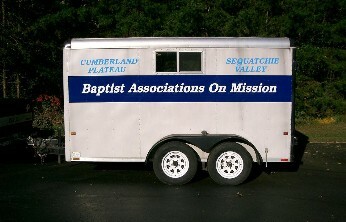 Cumberland Plateau Baptist Association supports this mission by recruiting and training local volunteers for Certification in Disaster Relief including instruction in chain saw safety. Recertification classes are also available. Reprinted in part from http://tndisasterrelief.org/. A more complete list of TBC Disaster Relief training is available through this website. Since 1994 the mission of Love Packages has been reclaiming God’s resources for His purposes. We have done this by asking people to share their bookshelves that are filled with Bibles and God’s teaching tools. Once we have received those materials, Love Packages sends them around the world, therefore sowing God’s word into the lives of those who cannot afford it. Love Packages is equipping orphans, evangelists, pastors and missionaries for the works of service all the while setting up distribution centers, lending libraries, bible college libraries, and holding crusades. When you give financially, donate bibles; commentaries; and Christian books, you are becoming a book missionary and aligning yourself with the mission to Share, Send, and Sow God’s Word! Love Packages Mission Statement reprinted with permission from http://www.elhm.org/. Cumberland Plateau Baptist Association supports Hodges Ministries by serving as a depository for recycled printed Christian materials including Sunday School literature, Bibles, Christian books and tracts donated from area churches. (A more complete list of needed materials can be found on the above website in addition to specific materials than can not be used.) We transport these materials quarterly to Decatur, Alabama, to be repackaged for shipment around the world. If you have a team from your church interested in traveling to Alabama to work in the Hodges distribution center, please contact the Association Office for additional information. The Associational WMU is how you can get radically involved in God’s mission. From preschoolers to adults, we learn about and pray for missions, as well as have opportunities to give, serve, and support missions and missionaries. We meet three times a year, in our local churches. Our meetings are held in March, July and November; they are open to everyone- men, women and children. Each meeting starts at 6:00 pm and ends at 7:00-7:05, and each meeting is followed by a meal. Everyone is welcome to stay and enjoy this free meal provided by the hosting church. We have a small mission project each meeting such as can food for our local food pantries, books for our Baby Comfort Station at the Cumberland county Fair each year, where we serve thousands, school supplies, etc. We also have a yearly mission project. In the past we have raised money to purchase a well for our missionaries and the community they serve in, meat for a pantry in Wartburg, animals for sustaining an income for the recipients. Our meetings are informative, purposeful, entertaining, and a meal is served, so bring the family and let’s engage in redemptive service together and show the love of our Lord and Savior Jesus Christ to the people while giving them an opportunity to hear the gospel.